↑ Birthdate and biographical detail: Football League website. ↑ Ingo Faulhaber. "IFFHS". Iffhs.de. สืบค้นเมื่อ 12 July 2010. 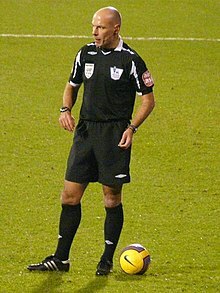 ↑ "Howard Webb : First person to referee Champions League and World Cup final". goal.com. หน้านี้แก้ไขล่าสุดเมื่อวันที่ 29 มิถุนายน 2561 เวลา 22:57 น.